Glass is romantic for some people. While glass is cool and hard to the touch, don’t forget that it was born in fire. There is passion in glass! 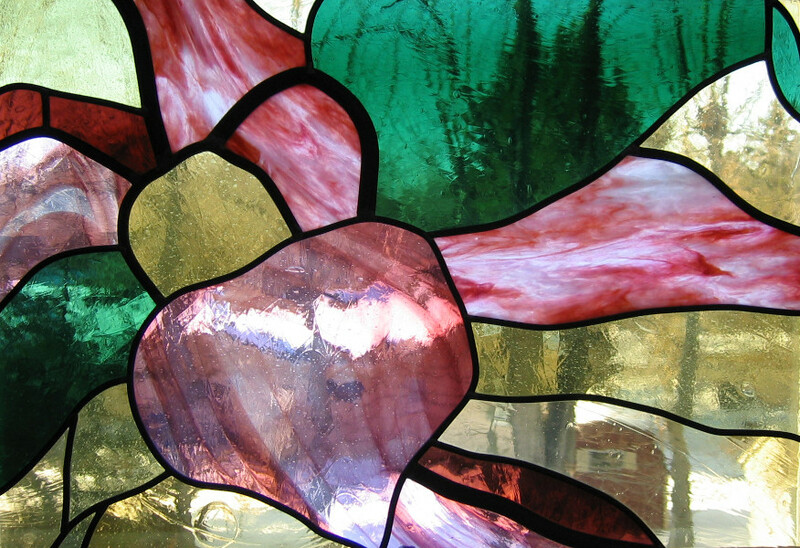 Not only do our glass creations express our own love of the medium, but often we’ve been called upon to create something to express romantic love. Over the years we have made a number of gifts for lovers, usually wedding gifts but also custom orders to commemorate wedding anniversaries. 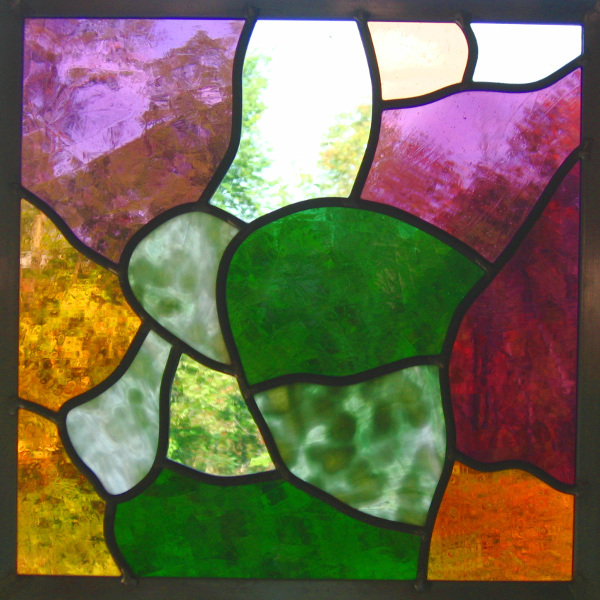 Whereas in recent years gifts tend to be fused glass bowls and platters, not that long ago we were making stained glass windows and autonomous panels to celebrate love. St Valentine, a third-century Roman martyr who has come to symbolize love, never saw a stained glass window. 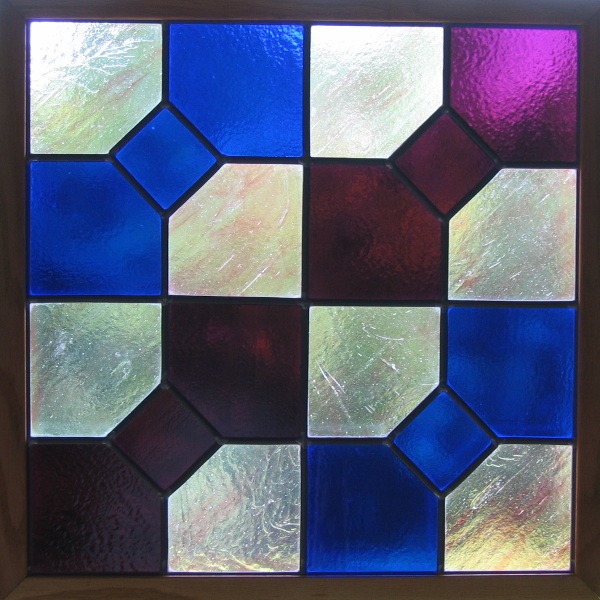 One of the oldest known examples of a window made by fitting together multiple pieces of colored glass dates to an English monastery founded in 686 AD, hundreds of years after Valentine died. 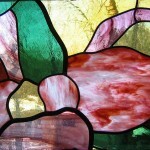 Never-the-less, in honor of Valentine’s Day this week, the pre-eminent holiday for lovers, I will recall a few of stained glass creations made in honor of love. 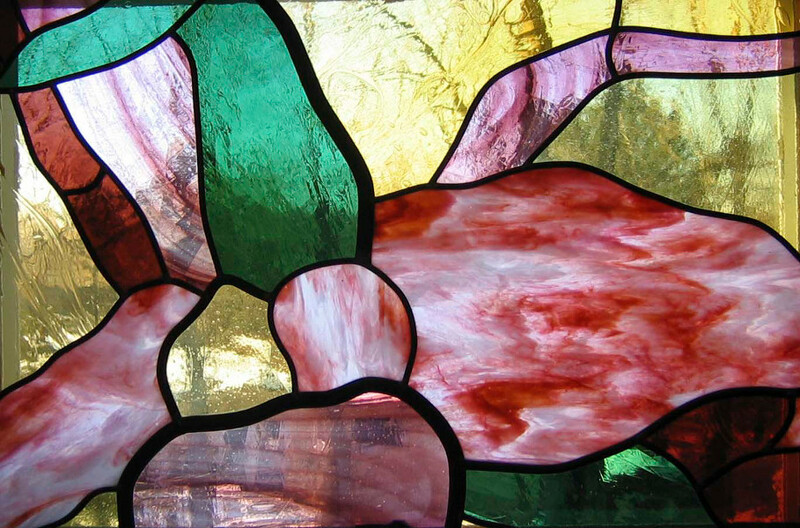 About thirty-five years ago, the family of Lillie and Roy Johnson commissioned us to create a stained glass panel for the couple’s 50th wedding anniversary. The children and their spouses wanted the panel to represent specific aspects of their parents’ life of love. 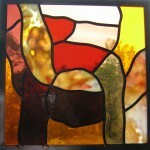 Imagery in the glass design denotes the couple’s Norwegian ancestry, Lutheran faith, and farm life. A golden sun and linked wedding bands signify their long-lasting marriage. 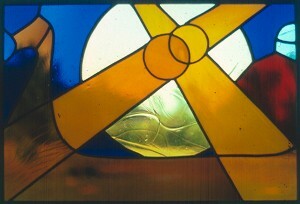 Made of mouth-blown German glass, the leaded panel was ready when Lillie and Roy celebrated their anniversary with children and grandchildren on June 15, 1982. 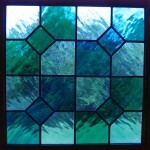 A stained glass window design can symbolize the daring promises of love in more subtle ways than overt symbols. More than twenty years after designing and creating the golden anniversary window, Jay and I gained the opportunity to create a set of wedding anniversary windows using a very different style of design. My preferred design style is to create lead lines depicting something from nature, and to color the design abstractly. A couple commemorated their own thirty-fifth wedding anniversary by commissioning us to create a pair of stained glass windows for their dining room. Orchids are one of the flowers symbolizing love and so the dramatic flowers of cattleya orchids became the motif for my abstract design. Not only the gorgeous cattleya blossom but also its rhizomes, roots, and fleshy leaves make excellent design elements. While cattleya orchids are available in colors across the spectrum, I selected glass hues not from real flowers but to coordinate with our clients’ room. The colors flow across the outlined orchid elements without regard for color realism. 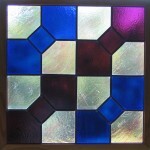 This wedding anniversary set of windows is named for a line in the poem “The Flower of Love” by Jessica Powers. 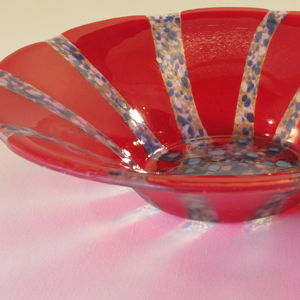 Like poetry, beautiful glass can express the beauty of love. 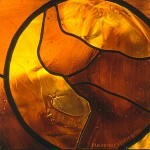 Mouth-blown glass is intrinsically beautiful and the most beautiful of “antique” glasses are streaky and reamy glasses. 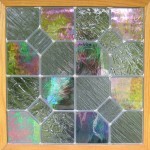 Streaky glass contains two or more hues swirled together. Reamy glass has prominent internal texture with large bubbles floating in what seem to be glass currents. Streaky reamy glass can be ravishingly beautiful. 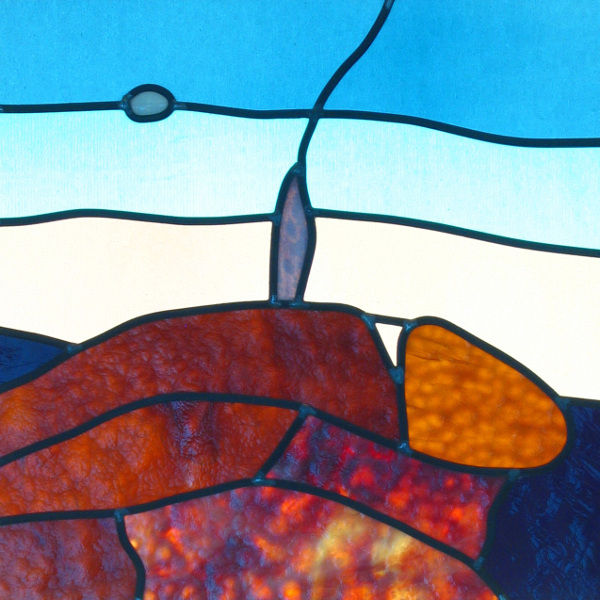 Many years ago I created a small panel featuring Hartley Wood streaky reamy glass in combination with other mouth-blown glass. The design and palette were both simple, all the better to let the glass shine. “Rhapsody in Brown” was a wedding gift. 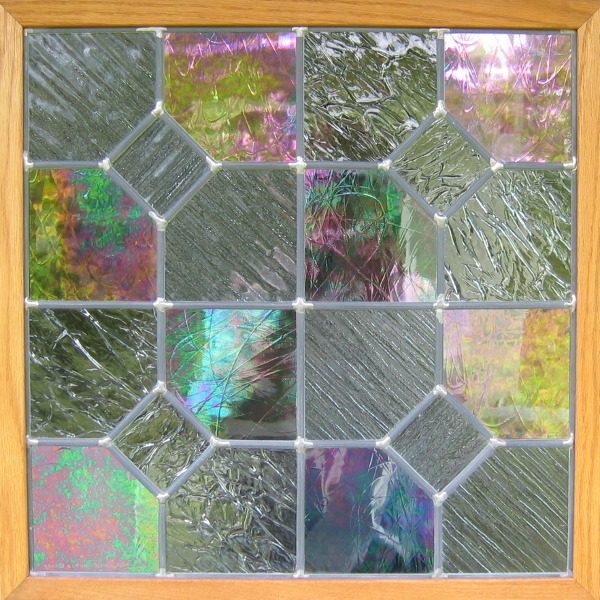 Lovely effects can also be achieved by combining hand-rolled opalescent glass with mouth-blown glass, as shown in these two additional examples of wedding gift panels. Transparency contrasts with opacity, the same hues playing with light in different ways. Just as complimentary and contrasting color and texture produce dynamism in works of art, complimentary personal qualities, not necessarily identical traits, contribute to a healthy love relationship. Playfulness is another important element of enduring love. In the early 2000s, we made several wedding gifts based on a quilt block design, “True Lovers Knot.” I had found the design in Quilt Patterns: Patchwork and Applique (St Louis, MO: Ladies Art Company, 1928), from which my aunt Amelia Otting had selected patterns for her many patchwork quilts. I don’t recall if Melie, as we called her, ever used “True Lover’s Knot,” which is similar to “Bowtie” but repeated four times in a smaller block. I selected it because the pattern’s name is appropriate for a wedding gift and the layout is easy to translate into glass. It was also fun to try new combinations of colors and/or glass textures to play off one another every time we fabricated a window. One wedding gift stands out because it was commissioned by a bride-to-be. 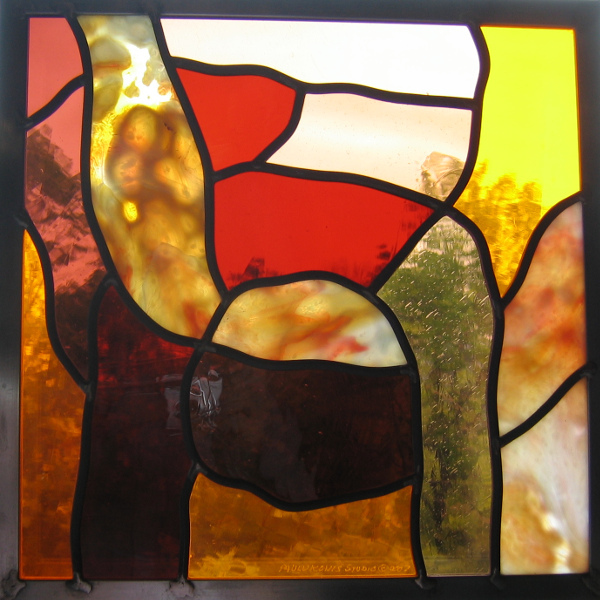 She showed us a photo she had taken of her fiance while they were hiking in mountains in the United States’ southwest and asked us to use it as the basis for a stained glass panel. We proposed an abstract rendition of the photo as a about 1 foot square, an idea she liked and which fit her budget. To fabricate the panel, Jay used a combination of opalescent glass (such as rich brown for the rocks) and mouth-blown glass (as in the sky). The simple design reminds the couple of their young love and engagement period “peak” experience, and it promises to someday convey the story of their love to their children and grandchildren. Having recalled these love stories, I feel romantic. 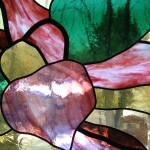 Time to find the man I love and with whom I share a love of glass artistry.